Seth Ambroz is a right wing for the Omaha Lancers of the United States Hockey League. 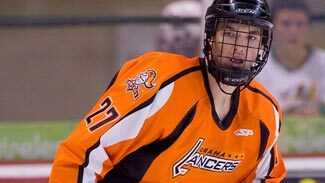 The 6-foot-3, 202-pound Ambroz, committed to the University of Minnesota in the fall of 2011, was just 15-years-old when he burst upon the USHL scene as a rookie in 2008-09. Through 49 games this season, Ambroz leads the team with 21 goals, 40 points and 202 shots. The New Prague, Minn., native was rated No. 28 on NHL Central Scouting's mid-term release of North American skaters in January. A participant of the 2010 NHL Research, Development and Orientation Camp fueled by G Series in August, Ambroz has offered to maintain a monthly blog for NHL.com that will chronicle his season leading up to the NHL Entry Draft in St. Paul, Minn.
Hi everyone! It's almost playoff time here in the USHL. I think it's been a good year so far. You see a lot of 60-plus point seasons from other players, but being a power-forward, I don't think about that too much. I think 40 points is a great accomplishment and hopefully, they'll keep coming. Right now I'm just not thinking about personal statistics too much. I'm having a fun year and we've had kind of a low-scoring team this year too, so I think just moving forward from here would be great. We have six games left and, really, we'd like to win them all but that's a tough thing to do in this league. But there are a lot of things you want to work on as a team down the stretch … you want to work on details heading into the playoffs. You want to work towards getting all the little things right and playing your best hockey heading into the playoffs. You just want to be playing well as a team at the right time and that time is entering the playoffs. Right now, we'd like to win these games to pull away from the pack a little because they're fighting for that second seed in the playoffs too (Omaha is currently second in the West -- one point ahead of Sioux Falls). Sioux Falls (Omaha's opponent on Wednesday) is right behind us and we have a tough grind with some road games. Road games will test every team's character right now, but we'll see what we bring to the table. (Three of the first five meetings between Omaha and Sioux Falls have been decided by a single goal. The top 6 teams in each conference qualify for the playoffs and the top 2 teams in each conference receive a playoff bye). You could look at the bye in two different ways, obviously we've had injuries this year and have a couple guys out so it would be good to get that bye and get some guys rested up. But you could look at it as, when you get that bye, you kind of get a little bit out of the loop by not playing and then go into the next series against a team that has already played so you have to get ready quick. But, either way, you can look at the positives or negatives, but I think we could probably use the rest right now with all the bumps and bruises, so we'll really push for that second spot and the bye. We made it to the conference final last year and fell short in Game 5 (to Fargo, 3-games-to-2) there so we'd like to get back and go even farther this time around. The media requests with the draft coming up fast hasn't been too bad. It's been nice to focus on the stretch run here in the last few games and just try not to think too much about the draft. I just want to focus on what's ahead of me and hope things turn out well.